Hamid Abdul Ghafoor of the ruling Maldivian Democratic Party (MDP) told theSouth Asian Monitorthat the MCFTA, running into 1,000 pages, was pushed through parliament in 10 minutes, giving no time for the MPs to read, understand and comment on it. MDP leader and former Maldivian President Mohamed Nasheed had toldReutersin November last year that Maldives could cancel the FTA with China. The coalition which ousted Yameen from power in the September 2018 presidential election has virtually broken up. The MDP has put up candidates for all the 87 seats in parliament calledmajlis. 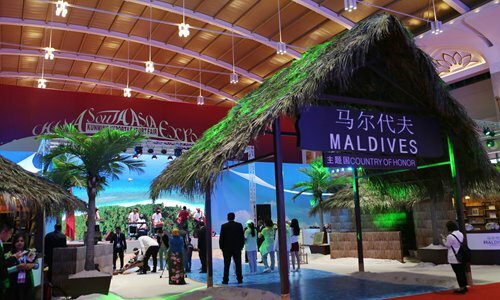 “If matters do not improve and if the Maldivian regime is seen to be dancing to India’s tune, Beijing could ask its citizens not to visit the Maldives as tourists. In a country like China, no Chinese would dare defy such a diktat. And if the Chinese do not come in the numbers they are doing now, the Maldivian tourism industry will crash. The bulk of tourists are Chinese. Although there has been no fall in the arrival of Western tourists, there has been no increase either. Our tourism industry is heavily dependent on arrivals from China and will continue to be so in the coming years. China could well exploit the chink in the Maldivian armor,” the official, who preferred anonymity, said.